California state Senate President Kevin de León arrives at the conference center for the UN climate talks in Lima, Peru. Image used with permission from Senator de León. The chattering classes of the climate policy world are abuzz with their customary post-mortems following the latest breathless two-week session of the United Nations Framework on Climate Change 20th Conference of Parties (also known simply as COP 20), held in Lima, Peru. 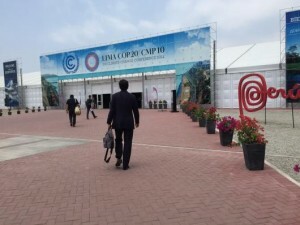 Consensus is forming around a “slightly better than nothing” assessment of the Lima Call for Climate Action, which was adopted in the wee hours of Sunday amidst the usual skirmishes over money, monitoring, and mandates. Lima clarified some of the expected content of the national pledges (“Intended Nationally Determined Contributions,” INDCs in COP shorthand) to be presented by all countries next year. Notwithstanding the softness engendered by the word “intended,” at least we aren’t firmly stuck in the “old world order” where only developed countries are taking on mitigation actions. While nations squabbled about intentions, another story was playing out on the sidelines of the COP, showcasing real, groundbreaking and consequential progress at the subnational level – within states, provinces, and cities. After spending the vast majority of my time in Lima with innovative and dynamic subnational leaders, I came away with an unbridled sense of optimism and renewed hope that there are pathways to climate progress, even if many of them go around rather than through the formal UN process. 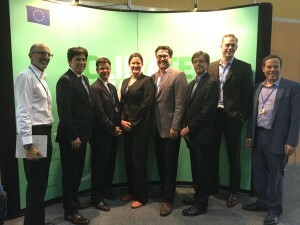 California’s delegation to the Lima climate negotiations. Image used with permission from Senator de León. California has long been a laboratory of climate change solutions and will be expanding its cap-and-trade program to cover transportation fuels in two short weeks. Meetings with the California contingent are always a sought-after ticket at the COPs, and California delegates are always eager to learn from and trade ideas with their counterparts around the world. A very encouraging trend is the evolution of subnational cooperation from platitudes to concrete plans. I moderated a panel highlighting the collaboration between California and China, a partnership that involves a substantive, two-way exchange of ideas and expertise on issues such as emissions trading, clean vehicles, sustainable infrastructure, and technology deployment. In less than two years, cities and provinces in China have developed pilot cap-and-trade programs that are paving the way for a future national emissions trading system in China. California has a lot to learn from the Chinese experience, and Chinese leaders studied the design of California’s system as the pilots were being developed. Subnational partnerships in North America are taking off, in part because of the lack of action at the national level, particularly in the U.S. and Canada. California and Quebec recently completed a successful joint allowance auction, the final step in fully linking the two jurisdictions’ cap-and-trade systems. In Lima, the top environmental officials from California, British Columbia, Ontario, and Quebec issued a joint statement resolving to “work together towards mid-term greenhouse gas reduction goals,” a key step towards locking in long-term action and unleashing innovation in low-carbon technologies. California Governor Jerry Brown announced his support for a 2030 GHG target at the UN Climate Summit in September, and legislation has been introduced in California that would establish a 2050 mandate and require interim targets in 2030 and 2040. While countries are submitting their INDCs, subnational governments are also putting their commitments to paper. An important initiative called The Compact of States and Regions, launched at the UN Climate Summit by The Climate Group, will aggregate and evaluate the commitments being taken by subnational governments around the world. States, provinces, and cities are not waiting for the UN or their national governments to act. Meanwhile, Governor Brown’s indefatigable policy czar Ken Alex is spearheading a “subnational INDC process,” wherein subnational leaders around the world will be invited to sign an agreement, to be unveiled over the next year, committing to reducing their emissions at least 80% below 1990 levels by 2050, or to cutting their per capita emissions to below two tons. Thankfully, states, provinces, and cities are not waiting for the UN or their national governments to act. There is a lot to be optimistic about, and subnational and subnational governments are showing leadership and forging ahead in what could be seen as a friendly competition to develop and implement the boldest and most successful climate change initiatives. Lima climate talks: What really happened. This entry was posted in Lima (COP-20), UN negotiations. Bookmark the permalink. Trackbacks are closed, but you can post a comment.